This variety of Kansas-made goodies includes a whirlwind of taste! 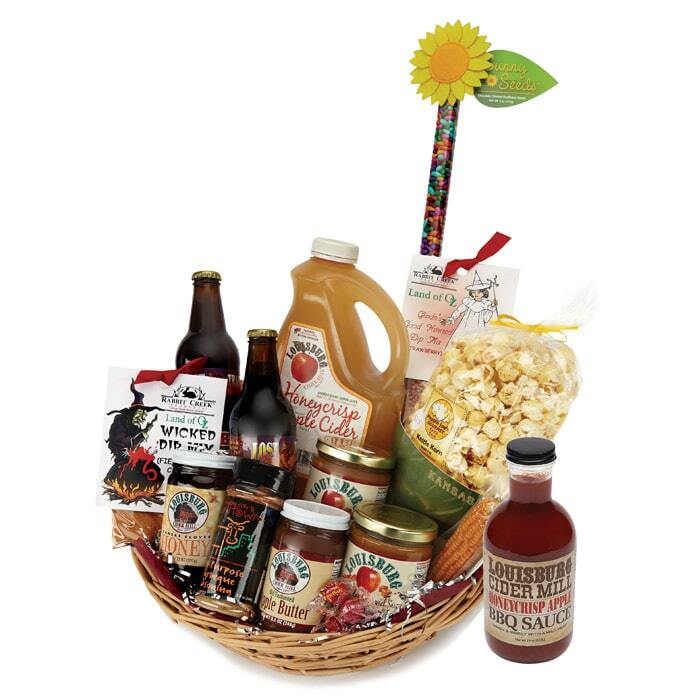 Get caught up in the rich flavors of Rabbit Creek Dips, the sweetness of our own Apple Caramel Sauce, Poppin’ Joe’s Kettle Corn, 1/2 gallon of Louisburg Honeycrisp Apple Cider, Sunny Sunflower Seeds in a fun tube with a felt flower, an amazing Popcorn Cob, and Louisburg Honeycrisp BBQ Sauce. There are 2 (12oz) bottles of Lost Trail Root Beer–give the caps a twist-er and enjoy! You’ll be blown away by this perfect gift for those who know there’s no place like home.